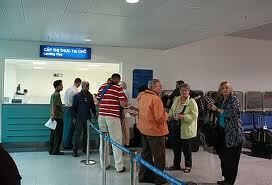 You are required to fulfill entry and customs forms when entering Vietnam. A new form (CHY2000) is currently used for the entry and exit procedure. In cases of re-entry or exit without any declarable items, you simply submit the copy of your entry and customs form (yellow paper) or fill out a new one. Cross (x) and fill out the first sixteen boxes of the form. You must submit this form to customs and immigration officers. 6. Other commodities outside duty-free luggage. When entering Vietnam: Visitors are permitted to bring in a duty-free allowance of 200 cigarettes; 50 cigars or 150 g of tobacco; 1.5l of liquor; and other items (excluding forbidden goods) amounting to a total value of less than US$ 300. Prohibited items include weapons, munitions, explosives and inflammables, firecrackers of all kinds, opium and other drugs, toxic chemicals, and cultural materials unsuitablefor Vietnamese society (pornographic seditious publications, films and photos), harmful child toys. If you break these rules, you are subject to Vietnamese laws. When leaving Vietnam: Any quantity exceeding 300g of gold must be declared and be approved by the State Bank. You are not allowed to take weapons, munitions, explosives, drugs, antiques, live wild animals, rare plants, or documents relating to the national security out of the country. If you break these rules, you are subject to Vietnamese laws. Do New Zealand citizens need a visa to Vietnam?